Category 1= Water that escapes from a clean and sanitary source such as faucets, toilet tanks, drinking fountains, etc. Carpeting, personal belongings, and other soft goods can usually be professionally dried and restored. While the initial water damage from these sources is not hazardous to your health, ignoring it can eventually cause mold or mildew growth in the affected areas which are harmful to your health. Clean water damage must be cleaned up before it has a chance to harbor mold or mildew growth. Category 2 (grey water) = Water contaminated with chemical, physical, or biological elements. Sources include dishwasher or washing machine overflows; additional cleaning and decontamination steps are required to prevent illness. Simply removing the water from dirty water damage is not enough, the affected area must also be cleaned and disinfected to prevent health risks. Category 3 water (black water) = Unsanitary water due to significant pathogens present. Category 3 water includes sewer backups, flooding from rivers or lakes, toilet overflows, or stagnant liquid that has begun to foster bacterial growth. Mold, microorganisms, and toxins from waste materials can result in a range of allergic reactions and extended exposure can even lead to more serious respiratory problems including infections and difficulty breathing. 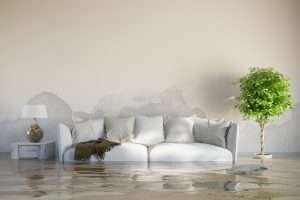 The “Class” of water damage is determined by the probable rate of evaporation based on the type of materials affected. Determining the class of water damage helps plan the amount and type of equipment used to treat, or remediate, the area. Class 1 – Slow Rate of Evaporation–Affects only a portion of a room or materials have low porosity, therefore minimum moisture is absorbed by the materials. Class 2 – Fast Rate of Evaporation– Water affects the entire room, carpet, and cushions which may have wicked up the walls. Class 3 – Fastest Rate of Evaporation– Water generally comes from overhead, affecting the entire area; walls, ceilings, insulation, carpet, cushion, etc. Class 4 – Specialty Drying Situations– Involves materials with a very low permeance/porosity, such as hardwood floors, concrete, crawlspaces, plaster, etc. Regardless of the source, water damage can have negative effects on your health. Get expert help from qualified experts such as Southeast Restoration in order to keep your family safe. Although you may have survived the water itself, be aware of the additional danger from mold. Diseases such as bronchial asthma, allergic rhinitis, allergic conjunctivitis, allergic fungal sinusitis, and occasionally hives (urticaria) are usually the consequence of allergic sensitization to the molds that grow when excess water is present. Emergency services are the initial steps in returning you to your home. SRG also provides professional deodorization, complete sanitizing, air ducts cleaning, odor removal, and structural repairs. Southeast Restoration Group is licensed in Georgia, Alabama, South Carolina, and Tennessee. Contact us as soon as possible to restore your home after water damage. Southeastrestoration.com or call 478.796.9500.